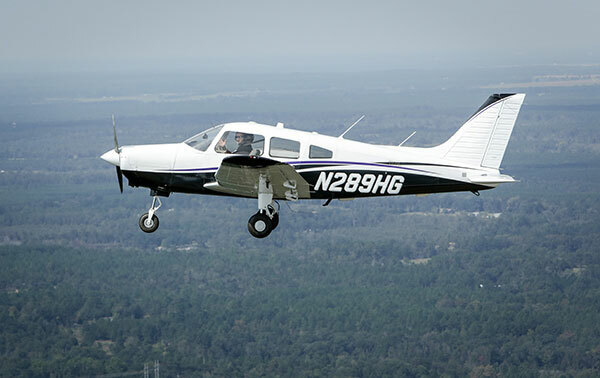 Learning to fly at Middle Georgia State University's School of Aviation is about to become a lot more affordable for prospective students who live in Alabama, Florida and South Carolina. Middle Georgia State (MGA) recently received permission from the University System of Georgia to charge students from those border states the same tuition as Georgia residents for aviation programs. The out-of-state tuition waiver, effective fall 2017, supports the School of Aviation's plans to expand throughout Georgia to make flight training more accessible, with Middle Georgia State's Eastman Campus remaining the University's main hub for aviation training. MGA's School of Aviation recently established its first satellite location at the Macon Downtown Airport. As part of a three-phase, state-funded expansion plan, the School of Aviation's goal is to establish other satellite locations. Partnerships with aviation facilities, corporate entities and schools in both the University System and Technical College System of Georgia, as well as proprietary institutions, are also featured in all three phases of the expansion plan. "Aerospace is one of Georgia's highest profile industries, with a huge economic impact," said Adon Clark, dean of the School of Aviation. "Middle Georgia State has the only public aviation school in the state, so we are uniquely positioned to educate and train professionals that the industry needs. The out-of-state waiver will help us extend our reach to potential students interested in the any of the aviation field’s variety of specialties." Clark said border state residents contact the school on a regular basis for admissions information but many end up not enrolling due to out-of-state tuition rates. Currently, MGA's out-of-state tuition for a full course load is about $6,000 per semester, compared to $1,630 for in-state tuition. Flight students also pay additional fees for aircraft use and training, so the tuition break afforded by the waiver would be especially significant to those from the border states. The School of Aviation's degree programs include flight (airplane and helicopter), air traffic management, aviation maintenance technology and aircraft structural technology. Residents of Alabama, Florida and South Carolina (AL, FL, SC) interested in exploring Middle Georgia State School of Aviation enrollment can contact Wesley Sewell, Office of Admissions recruiter, at wesley.sewell@mga.edu or (478) 960-2231.